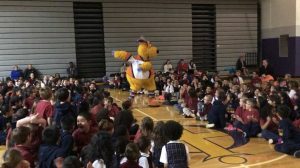 The Lehigh Valley Phantoms 2019 Bully Busters Unite Program made visits to St. John Vianney Regional School in Allentown and St. Ann School in Emmaus last week. The Phantoms’ mascot, meLVin visited with the kids and helped to teach them some helpful tips for dealing with situations of bullying. The Phantoms kicked off the road trip with a thrilling 4-3 overtime win in Rochester. Pascal Laberge put the cherry on top of his best game as a pro with the overtime winner to finish off a hat trick and four-point performance. Chris Conner tallied three assists in the contest. 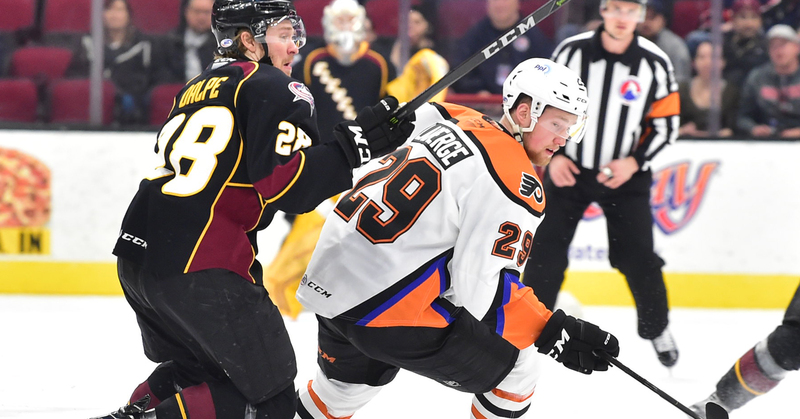 In the first game for the Phantoms in Cleveland since 2009, Lehigh Valley fell 6-3 to the Monsters on Friday night. 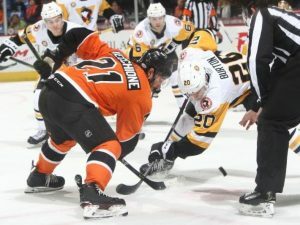 New father, Colin McDonald scored in his second game back after the birth of his daughter, and Byron Froese and Carsen Twarynski also found the back of the net for the Phantoms. The Phantoms got their first win of the season against the Monsters with a 3-2 shootout victory. Mike Huntebrinker was recalled from Reading that morning and wound up scoring the shootout winner for Lehigh Valley. Alex Lyon made 42 saves for the Phantoms, including seven during the overtime period and shutout Cleveland in the shootout. The Lehigh Valley Phantoms will make their final trip to Charlotte this season to take on the Checkers in back-to-back games, starting tonight at 7:00. The Phantoms have struggled against the first place Checkers this season, entering tonight’s game with a 2-4 record and 0-2 inside Bojangles’ Coliseum. Charlotte holds the best record in the AHL and has already clinched an Atlantic Division title. 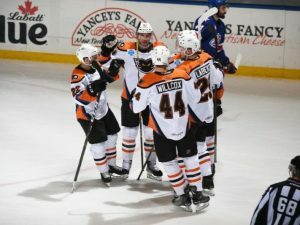 The Phantoms have played their best hockey on Wednesday night, going 8-2 in midweek matchups this season, including a 3-2 overtime win against Charlotte on Wednesday, November 14. Mike Vecchione has elevated his game against the division’s best, leading Lehigh Valley with 6 points (3g, 3a) in 6 games against the Checkers. The Phantoms will return to PPL Center Saturday to take on the Wilkes-Barre/Scranton Penguins. Lehigh Valley enters the weekend 4-4-2 against the Penguins. 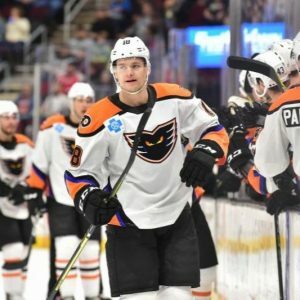 Byron Froese has been the recent Penguins killer, notching 4 points (3g, 1a) in 4 games against Wilkes-Barre/Scranton since joining the Phantoms. The Phantoms and Penguins will face-off for the 12th and final time this season in a Sunday matinee at PPL Center. Despite being Lehigh Valley’s most commonly faced opponent, it marks the first matchup on a Sunday between the two Keystone State rivals. Things have been chippy between these two rivals, with the teams totaling 334 penalty minutes through the first 10 meetings. Rookie forward Pascal Laberge picked up his first professional multi-point game, multi-goal game, hat trick, and overtime winner in Wednesday’s 4-3 OT victory in Rochester. 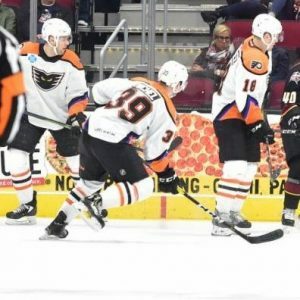 It was the first hat trick by a Phantoms player this season and first since Phil Varone on February 21, 2018. Byron Froese is heating up down the stretch, tallying points in four straight games, including back-to-back multi-point games. He has six points (3g, 3a) in the last four games. Former University of Maine captain, Rob Michel made his professional debut on March 29 in Cleveland and registered two shots in the game. 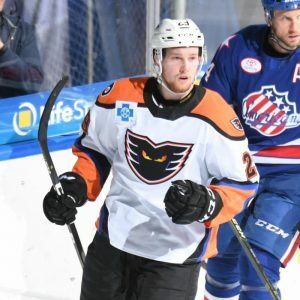 Michel signed an ATO with the Phantoms on March 19.